"Radiocarbon" redirects here. For the scientific journal, see Radiocarbon (magazine). For the dating technique, see Radiocarbon dating. There are three naturally occurring isotopes of carbon on Earth: carbon-12, which makes up 99% of all carbon on Earth; carbon-13, which makes up 1%; and carbon-14, which occurs in trace amounts, making up about 1 or 1.5 atoms per 1012 atoms of carbon in the atmosphere. Carbon-12 and carbon-13 are both stable, while carbon-14 is unstable and has a half-life of 5,730±40 years. Carbon-14 decays into nitrogen-14 through beta decay. A gram of carbon containing 1 atom of carbon-14 per 1012 atoms will emit ~0.2 beta particles per second. The primary natural source of carbon-14 on Earth is cosmic ray action on nitrogen in the atmosphere, and it is therefore a cosmogenic nuclide. However, open-air nuclear testing between 1955–1980 contributed to this pool. The different isotopes of carbon do not differ appreciably in their chemical properties. This resemblance is used in chemical and biological research, in a technique called carbon labeling: carbon-14 atoms can be used to replace nonradioactive carbon, in order to trace chemical and biochemical reactions involving carbon atoms from any given organic compound. By emitting an electron and an electron antineutrino, one of the neutrons in the carbon-14 atom decays to a proton and the carbon-14 (half-life of 5700 ± 40 years) decays into the stable (non-radioactive) isotope nitrogen-14. The emitted beta particles have a maximum energy of 156 keV, while their weighted mean energy is 49 keV. These are relatively low energies; the maximum distance traveled is estimated to be 22 cm in air and 0.27 mm in body tissue. The fraction of the radiation transmitted through the dead skin layer is estimated to be 0.11. Small amounts of carbon-14 are not easily detected by typical Geiger–Müller (G-M) detectors; it is estimated that G-M detectors will not normally detect contamination of less than about 100,000 disintegrations per minute (0.05 µCi). Liquid scintillation counting is the preferred method. The G-M counting efficiency is estimated to be 3%. The half-distance layer in water is 0.05 mm. Radiocarbon dating is a radiometric dating method that uses (14C) to determine the age of carbonaceous materials up to about 60,000 years old. The technique was developed by Willard Libby and his colleagues in 1949 during his tenure as a professor at the University of Chicago. Libby estimated that the radioactivity of exchangeable carbon-14 would be about 14 disintegrations per minute (dpm) per gram of pure carbon, and this is still used as the activity of the modern radiocarbon standard. In 1960, Libby was awarded the Nobel Prize in chemistry for this work. One of the frequent uses of the technique is to date organic remains from archaeological sites. Plants fix atmospheric carbon during photosynthesis, so the level of 14C in plants and animals when they die approximately equals the level of 14C in the atmosphere at that time. However, it decreases thereafter from radioactive decay, allowing the date of death or fixation to be estimated. The initial 14C level for the calculation can either be estimated, or else directly compared with known year-by-year data from tree-ring data (dendrochronology) up to 10,000 years ago (using overlapping data from live and dead trees in a given area), or else from cave deposits (speleothems), back to about 45,000 years before the present. A calculation or (more accurately) a direct comparison of carbon-14 levels in a sample, with tree ring or cave-deposit carbon-14 levels of a known age, then gives the wood or animal sample age-since-formation. 3: The "equal" equation is for living organisms, and the unequal one is for dead organisms, in which the C-14 then decays (See 2). The highest rate of carbon-14 production takes place at altitudes of 9 to 15 km (30,000 to 49,000 ft) and at high geomagnetic latitudes. The rate of 14C production can be modelled, yielding values of 16,400 or 18,800 atoms of 14C per second per square meter of the Earth's surface, which agrees with the global carbon budget that can be used to backtrack, but attempts to measure the production rate directly in situ were not very successful. Production rates vary because of changes to the cosmic ray flux caused by the heliospheric modulation (solar wind and solar magnetic field), and due to variations in the Earth's magnetic field. The latter can create significant variations in 14C production rates, although the changes of the carbon cycle can make these effects difficult to tease out. Occasional spikes may occur; for example, there is evidence for an unusually high production rate in AD 774–775, caused by an extreme solar energetic particle event, strongest for the last ten millennia. Another "extraordinarily large" 14C increase (20‰) has been recently (2017) associated with the 5480 BC event, which is however unlikely to be a solar energetic particle event. Carbon-14 may also be produced by lightning bolts  but in amounts negligible compared to cosmic ray prodcution. Carbon-14 can also be produced by other neutron reactions, including in particular 13C(n,γ)14C and 17O(n,α)14C with thermal neutrons, and 15N(n,d)14C and 16O(n,3He)14C with fast neutrons. The most notable routes for 14C production by thermal neutron irradiation of targets (e.g., in a nuclear reactor) are summarized in the table. Carbon-14 may also be radiogenic (cluster decay of 223Ra, 224Ra, 226Ra). However, this origin is extremely rare. The above-ground nuclear tests that occurred in several countries between 1955 and 1980 (see nuclear test list) dramatically increased the amount of carbon-14 in the atmosphere and subsequently in the biosphere; after the tests ended, the atmospheric concentration of the isotope began to decrease. One side-effect of the change in atmospheric carbon-14 is that this has enabled some options (e.g., bomb-pulse dating) for determining the birth year of an individual, in particular, the amount of carbon-14 in tooth enamel, or the carbon-14 concentration in the lens of the eye. Carbon-14 is produced in coolant at boiling water reactors (BWRs) and pressurized water reactors (PWRs). It is typically released to the atmosphere in the form of carbon dioxide at BWRs, and methane at PWRs. Best practice for nuclear power plant operator management of carbon-14 includes releasing it at night, when plants are not photosynthesizing. After production in the upper atmosphere, the carbon-14 atoms react rapidly to form mostly (about 93%) 14CO (carbon monoxide), which subsequently oxidizes at a slower rate to form 14CO2, radioactive carbon dioxide. The gas mixes rapidly and becomes evenly distributed throughout the atmosphere (the mixing timescale in the order of weeks). Carbon dioxide also dissolves in water and thus permeates the oceans, but at a slower rate. The atmospheric half-life for removal of 14CO2 has been estimated to be roughly 12 to 16 years in the northern hemisphere. The transfer between the ocean shallow layer and the large reservoir of bicarbonates in the ocean depths occurs at a limited rate. 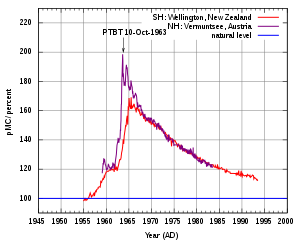 In 2009 the activity of 14C was 238 Bq per kg carbon of fresh terrestrial biomatter, close to the values before atmospheric nuclear testing (226 Bq/kg C; 1950). Many man-made chemicals are derived from fossil fuels (such as petroleum or coal) in which 14C is greatly depleted. 14CO2--or rather, its relative absence—is therefore used to determine the relative contribution (or mixing ratio) of fossil fuel oxidation to the total carbon dioxide in a given region of the Earth's atmosphere. Dating a specific sample of fossilized carbonaceous material is more complicated. Such deposits often contain trace amounts of carbon-14. These amounts can vary significantly between samples, ranging up to 1% of the ratio found in living organisms, a concentration comparable to an apparent age of 40,000. This may indicate possible contamination by small amounts of bacteria, underground sources of radiation causing the 14N(n,p) 14C reaction, direct uranium decay (although reported measured ratios of 14C/U in uranium-bearing ores would imply roughly 1 uranium atom for every two carbon atoms in order to cause the 14C/12C ratio, measured to be on the order of 10−15), or other unknown secondary sources of carbon-14 production. The presence of carbon-14 in the isotopic signature of a sample of carbonaceous material possibly indicates its contamination by biogenic sources or the decay of radioactive material in surrounding geologic strata. In connection with building the Borexino solar neutrino observatory, petroleum feedstock (for synthesizing the primary scintillant) was obtained with low 14C content. In the Borexino Counting Test Facility, a 14C/12C ratio of 1.94×10−18 was determined; probable reactions responsible for varied levels of 14C in different petroleum reservoirs, and the lower 14C levels in methane, have been discussed by Bonvicini et al. Since many sources of human food are ultimately derived from terrestrial plants, the carbon that comprises our bodies contains carbon-14 at almost the same concentration as the atmosphere. The rates of disintegration of potassium-40 and carbon-14 in the normal adult body are comparable (a few thousand disintegrated nuclei per second). The beta-decays from external (environmental) radiocarbon contribute approximately 0.01 mSv/year (1 mrem/year) to each person's dose of ionizing radiation. This is small compared to the doses from potassium-40 (0.39 mSv/year) and radon (variable). Carbon-14 can be used as a radioactive tracer in medicine. In the initial variant of the urea breath test, a diagnostic test for Helicobacter pylori, urea labeled with approximately 37 kBq (1.0 μCi) carbon-14 is fed to a patient (i.e., 37,000 decays per second). In the event of a H. pylori infection, the bacterial urease enzyme breaks down the urea into ammonia and radioactively-labeled carbon dioxide, which can be detected by low-level counting of the patient's breath. The 14C urea breath test has been largely replaced by the 13C urea breath test, which has no radiation issues. ^ Waptstra, A.H.; Audi, G.; Thibault, C. "AME atomic mass evaluation 2003". Archived from the original on 2008-09-23. Retrieved 2007-06-03. ^ Kamen, Martin D. (1963). "Early History of Carbon-14: Discovery of this supremely important tracer was expected in the physical sense but not in the chemical sense". Science. 140 (3567): 584–590. Bibcode:1963Sci...140..584K. doi:10.1126/science.140.3567.584. PMID 17737092. ^ Godwin, H. (1962). "Half-life of radiocarbon". Nature. 195 (4845): 984. Bibcode:1962Natur.195..984G. doi:10.1038/195984a0. ^ "What is carbon dating?". National Ocean Sciences Accelerator Mass Spectrometry Facility. Archived from the original on July 5, 2007. Retrieved 2007-06-11. ^ a b Be. "14C Comments on evaluation of decay data" (PDF). www.nucleide.org. LNHB. Archived (PDF) from the original on 22 November 2016. Retrieved 22 November 2016. ^ "Radiation Safety Manual for Laboratory Users, Appendix B: The Characteristics of Common Radioisotopes" Archived 2013-10-02 at the Wayback Machine, Princeton University. ^ "Material Safety Data Sheet. Carbon-14" Archived 2013-03-12 at the Wayback Machine, University of Michigan. ^ Arnold, J. R.; Libby, W. F. (1949). "Age Determinations by Radiocarbon Content: Checks with Samples of Known Age". Science. 110 (2869): 678–680. Bibcode:1949Sci...110..678A. doi:10.1126/science.110.2869.678. PMID 15407879. ^ "Carbon 14:age calculation". C14dating.com. Archived from the original on 2007-06-10. Retrieved 2007-06-11. ^ "Class notes for Isotope Hydrology EESC W 4886: Radiocarbon 14C". Martin Stute's homepage at Columbia. Archived from the original on 2006-09-24. Retrieved 2007-06-11. ^ Kovaltsov, Gennady A.; Mishev, Alexander; Usoskin, Ilya G. (2012). "A new model of cosmogenic production of radiocarbon 14C in the atmosphere". Earth and Planetary Science Letters. 337–338: 114–120. arXiv:1206.6974. Bibcode:2012E&PSL.337..114K. doi:10.1016/j.epsl.2012.05.036. ISSN 0012-821X. ^ Poluianov, S. V.; et al. (2016). "Production of cosmogenic isotopes 7Be, 10Be, 14C, 22Na, and 36Cl in the atmosphere: Altitudinal profiles of yield functions". Journal of Geophysical Research: Atmospheres. 121 (13): 8125–8136. arXiv:1606.05899. Bibcode:2016JGRD..121.8125P. doi:10.1002/2016JD025034. ^ a b Hain, Mathis P.; Sigman, Daniel M.; Haug, Gerald H. (2014). "Distinct roles of the Southern Ocean and North Atlantic in the deglacial atmospheric radiocarbon decline" (PDF). Earth and Planetary Science Letters. 394: 198–208. Bibcode:2014E&PSL.394..198H. doi:10.1016/j.epsl.2014.03.020. ISSN 0012-821X. Archived (PDF) from the original on 2015-12-22. ^ a b Ramsey, C. Bronk (2008). "Radiocarbon Dating: Revolutions in Understanding". Archaeometry. 50 (2): 249–275. doi:10.1111/j.1475-4754.2008.00394.x. ^ Miyake, Fusa; Nagaya, Kentaro; Masuda, Kimiaki; Nakamura, Toshio (2012). "A signature of cosmic-ray increase in ad 774–775 from tree rings in Japan" (PDF). Nature. 486 (7402): 240–2. Bibcode:2012Natur.486..240M. doi:10.1038/nature11123. PMID 22699615. Archived from the original (PDF) on 2015-07-06. ^ Usoskin; et al. (2013). "The AD775 cosmic event revisited: the Sun is to blame". Astron. Astrophys. 552: L3. arXiv:1302.6897. Bibcode:2013A&A...552L...3U. doi:10.1051/0004-6361/201321080. ^ Mekhaldi; et al. (2015). "Multiradionuclide evidence for the solar origin of the cosmic-ray events of ᴀᴅ 774/5 and 993/4". Nature Communications. 6: 8611. Bibcode:2015NatCo...6E8611M. doi:10.1038/ncomms9611. PMC 4639793. PMID 26497389. ^ Miyake, F.; Jull, A. J.; Panyushkina, I. P.; Wacker, L.; Salzer, M.; Baisan, C. H.; Lange, T.; Cruz, R.; Masuda, K.; Nakamura, T. (2017). "Large 14C excursion in 5480 BC indicates an abnormal sun in the mid-Holocene". Proceedings of the National Academy of Sciences of the United States of America. 114 (5): 881–884. Bibcode:2017PNAS..114..881M. doi:10.1073/pnas.1613144114. PMC 5293056. PMID 28100493. ^ Davide Castelvecchi. "Lightning makes new isotopes. Physicists show that thunderstorms trigger nuclear reactions in the atmosphere." Nature, 22 Nov 2017. ^ a b Yim, Man-Sung; Caron, François (2006). "Life cycle and management of carbon-14 from nuclear power generation". Progress in Nuclear Energy. 48: 2–36. doi:10.1016/j.pnucene.2005.04.002. ^ "Atmospheric δ14C record from Wellington". Trends: A Compendium of Data on Global Change. Carbon Dioxide Information Analysis Center. 1994. Archived from the original on 2014-02-01. Retrieved 2007-06-11. ^ Levin, I.; et al. (1994). "δ14C record from Vermunt". Trends: A Compendium of Data on Global Change. Carbon Dioxide Information Analysis Center. Archived from the original on 2008-09-23. ^ "Radiocarbon dating". University of Utrecht. Archived from the original on 2007-12-09. Retrieved 2008-02-19. ^ Stenstrom, K.; Georgiadou, E. (August 2010). "Bomb-Pulse Dating of Human Material: Modeling the Influence of Diet". Radiocarbon. 52 (2): 800–807. doi:10.1017/S0033822200045811. Archived from the original on 2014-10-20. ^ "Radiation in Teeth Can Help Date, ID Bodies, Experts Say". National Geographic News. 2005-09-22. Archived from the original on 2007-04-25. ^ Spalding KL, Buchholz BA, Bergman LE, Druid H, Frisen J (2005-09-15). "Forensics: age written in teeth by nuclear tests". Nature. 437 (7057): 333–4. Bibcode:2005Natur.437..333S. doi:10.1038/437333a. PMID 16163340. ^ Lynnerup, Niels; Kjeldsen, Henrik; Heegaard, Steffen; Jacobsen, Christina; Heinemeier, Jan (2008). Gazit, Ehud (ed.). "Radiocarbon Dating of the Human Eye Lens Crystallines Reveal Proteins without Carbon Turnover throughout Life". PLoS ONE. 3 (1): e1529. Bibcode:2008PLoSO...3.1529L. doi:10.1371/journal.pone.0001529. PMC 2211393. PMID 18231610. ^ "EPRI | Product Abstract | Impact of Nuclear Power Plant Operations on Carbon-14 Generation, Chemical Forms, and Release". www.epri.com. Archived from the original on 2016-08-18. Retrieved 2016-07-07. ^ "EPRI | Product Abstract | Carbon-14 Dose Calculation Methods at Nuclear Power Plants". www.epri.com. Archived from the original on 2016-08-18. Retrieved 2016-07-07. ^ "Carbon-14 and the environment". Institute for Radiological Protection and Nuclear Safety. Archived from the original on 2015-04-18. ^ "Human Health Fact Sheet – Carbon 14" (PDF). Argonne National Laboratory, EVS. August 2005. Archived from the original (PDF) on 2011-07-16. ^ Choppin, G.R. ; Liljenzin, J.O. and Rydberg, J. (2002) "Radiochemistry and Nuclear Chemistry", 3rd edition, Butterworth-Heinemann, ISBN 978-0-7506-7463-8. ^ "The Basics: 14C and Fossil Fuels". NOAA ESRL GMD Education and Outreach. Archived from the original on 25 September 2015. Retrieved 9 Dec 2015. All other atmospheric carbon dioxide comes from young sources–namely land-use changes (for example, cutting down a forest in order to create a farm) and exchange with the ocean and terrestrial biosphere. This makes 14C an ideal tracer of carbon dioxide coming from the combustion of fossil fuels. Scientists can use 14C measurements to determine the age of carbon dioxide collected in air samples, and from this can calculate what proportion of the carbon dioxide in the sample comes from fossil fuels. ^ Lowe, David (1989). "Problems associated with the use of coal as a source of C14-free background material". Radiocarbon. 31 (2): 117–120. doi:10.1017/S0033822200044775. Archived from the original on 2013-07-24. ^ Jull, A. J. T.; Barker, D.; Donahue, D. J. (1985). "Carbon-14 Abundances in Uranium Ores and Possible Spontaneous Exotic Emission from U-Series Nuclides". Meteoritics. 20: 676. Bibcode:1985Metic..20..676J. ^ Alimonti, G.; et al. (1998). "Measurement of the 14C abundance in a low-background liquid scintillator". Physics Letters B. 422 (1–4): 349–358. Bibcode:1998PhLB..422..349B. doi:10.1016/S0370-2693(97)01565-7. ^ "Society of Nuclear Medicine Procedure Guideline for C-14 Urea Breath Test" (PDF). snm.org. 2001-06-23. Archived from the original (PDF) on 2007-09-26. Retrieved 2007-07-04. Kamen, Martin D. (1985). Radiant Science, Dark Politics: A Memoir of the Nuclear Age. Berkeley: University of California Press. ISBN 978-0-520-04929-1.